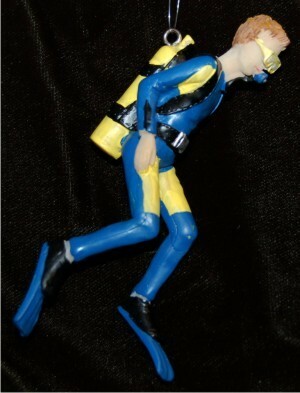 New Winter 2018: A rare find in fully 3-dimensional detail, this diver is ready to go deep to explore reefs or the ocean floor and all the sea creatures that live far below the surface! The ocean SCUBA diver male personalized Christmas ornament shows lifelike detail and make a great gift for the divers on your holiday or birthday list. These scuba ornaments personalized for each recipient are a great way to commemorate a memorable dive too. Give us his name, and it will be hand applied using a handsome font to create a memento that will always be displayed with fondness. The male scuba diver personalized Christmas ornament arrives in our classic velvet gift bag.